Bill graduated from Babson College in 1982 and immediately began working at Burke Distributing Corporation (BDC). After one year, he moved to Redemco Inc. as comptroller for two years, then moved back to BDC as comptroller, later becoming the sales manager, then operations manager and in 1994, president and CEO. As the third generation of the family, Bill, his brothers, Patrick and Tim, with cousins Austin and Alina, focused on rebuilding the company, totally dedicated and committed to providing customers with superior service. Austin attended Curry college and began his career at Burke Distributing in 1987. He has worked in virtually every department in the company, from sales to warehouse and operations. Named Operations Manager in 1994, he brings more than 20 years of experience to this core department. Tim attended high school at Thayer Academy in Braintree (‘89) and went on to study at Saint Lawrence University in upstate New York. He joined the company in 1993, working on the night shift supervising the loading of the trucks and the warehouse. In 1996, Tim shifted to sales where he ran various sales routes, eventually moving to on premise sales supervisor to brand manager to VP of Sales. He was the General Manager of the Red Bull division for 10 years growing the brand in the Massachusetts territory and in 2018 became the General Manager of the Beer Division. In 1935, in the small town of Clinton, MA local grocer Walter Burke had the vision of expanding his business beyond his retail market to the post-Prohibition era of wholesaling alcohol. Walter’s first opportunity came when a New York-based beer, Flanagan–Nay, was introduced to the area. With his sights set first and foremost on customer service, Walter’s newfound venture was off and running. 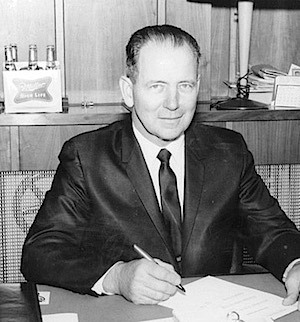 There were many challenges which required his creativity, flexibility, and perseverance, but by the 1950s his business had grown significantly enough to enable Burke Distributing to acquire the rights to distribute Miller Brewing and other fine beer brands. The Sixties were a decade of growth. While people were enjoying a Miller High Life, Burke Distributing was planning to move their operation from Clinton to Dorchester. 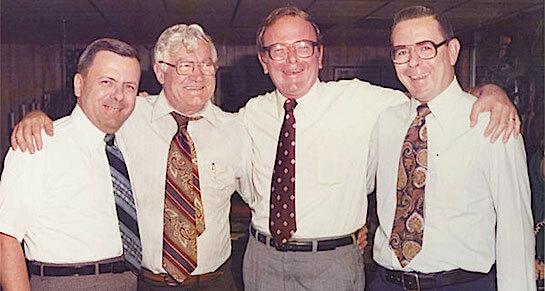 The 1970s produced more changes as Walter’s sons, Bill, Austin and Walter began spearheading that growth, nearly exceeding the 10-million-case mark thanks to the introduction of Lite beer. The Eighties and Nineties brought more changes. Beer consumers wanted different styles and tastes, and Burke expanded into imports. Meanwhile, labor issues and a restructure in the portfolio netted less than 1 million cases in some years. There was change in senior management, with William G. Burke now company president and family members Tim and Austin sharing departmental management duties. It was their passion, inherited from their grandfather, Walter, that slowly rebuilt the number of cases the company sold each year and elevated Burke Distributing to a first-choice distributor in 2000. A new century brought new challenges. Mike’s Lemonade was the hottest trend, Red Bull energy drink was introduced, now distributed from the borders of New Hampshire to the tip of Cape Cod, and suppliers and wholesalers were merging to stay ahead of the competition. In 2003, Burke Distributing Corporation purchased the distributing rights for Coors Brewing Company, along with Guinness and other brands, exclusively for the Boston market. In this decade, the family and the company continued growing their passion to be a world-class distributor with state-of-the-art technology for the sales team, and a driver force and product selection team that allowed them to provide accurate and dependable service to their customers. In 2009, Burke Distributing Corporation extended its product portfolio to include spirits, using the same model that made it a first choice distributor of beer. It has been more than 75 years since Walter Burke’s vision and passion started Burke Distributing Corporation and it is now in the hands of the third generation of his family who share this same passion. Today BDC enjoys a reputation as an award-winning company with a long-standing commitment to supporting local communities. Employees participated in the South Shore Hospital 2013 walk for hospice at the South Shore Plaza in Braintree, MA. Burke was a proud supporter of the Miller High Life “Give a Veteran a Piece of the High Life” program. Burke participates annually in the Coors Light “Pin Up Program” supporting St. Jude’s Children’s Hospital in the fall. Burke Distributing Corporation (BDC) believes in the spirit of giving. We have been giving back to our community for many years and are proud of that tradition. BDC gives financial support, product donations, or gift items in amounts that vary according to need of the organization and level of support determined appropriate by the BDC Donation/Sponsorship Committee. The committee meets four times a year (on a day within the first full week of February, May, August and November), and recipients will be notified via email of the committee decision. Due to requests being well in excess of our giving capacity, our donations will be limited to organizations located in our community (Eastern Massachusetts). A decision to decline a request does not imply that the applicant’s program is not needed or valued, but simply that it does not fall within our giving guidelines or priorities, or that funds or product are not available. Following our Core Value of Responsibility, we do not generally support organizations that benefit individuals under the legal drinking age; however, all requests are reviewed on a case-by-case basis. Holds an IRS section 501(c)(3) status AND is registered under Chapter 180 of the Massachusetts General Laws registered with the Massachusetts Attorney General Division of Public Charities. Gives a high percentage of donations directly to their cause. Sends their required information before the preferred review month. Submits completed request to donations@burkedist.com. The committee requires a completed Donation Application (click download below), a description of the request on company letterhead, a copy of both your IRS section 501(c)(3) status and your Massachusetts registration status, and any other supporting information you deem important. Written confirmation that the donated beer will be served at an event for which a section 14 special liquor license has been issued in order to serve alcohol AND a copy of the liquor license prior to the event. Written confirmation that the donated beer will not be used as a prize in any game of chance. Thank you for your interest in Burke Distributing Corporation! In Fall 2014, Burke Distributing launched a comprehensive recycling program. All offices and warehouses are equipped with recycling bins. We installed a solar-powered snow scraper (pictured here) for the winter season to remove snow from the top of our trucks. In Spring 2015, Burke made the switch to a paperless payroll system.